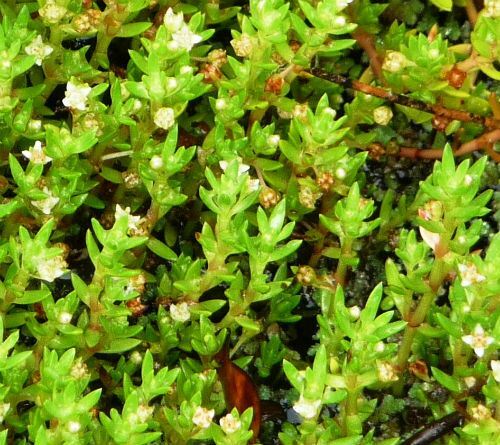 Crassula helmsii, the Swamp Stonecrop, is an aquatic or bog plant. Plants may creep or float depending on the depth of water. Stems will reach a length of 30 centimetres. Small leaves are succulent, linear, and green or reddish in colour. Small white flowers are carried in the upper leaf axils. Flowering is prolific in spring. C. helmsii is widespread in NSW and also occurs in Victoria, Tasmania, Western Australia, South Australia as well as New Zealand. In New Zealand the species is known as Pygmyweed. The Swamp Stonecrop has become naturalised in the United Kingdom. Propagate by division or from stem cuttings.